As the weekend approaches and the heat still raging in most of the United States, I decided to look at some other options for training. If it's still too hot to run and you just don't want to take on a treadmill workout, try pool running. It may sound a little weird, but after reading this article on the Runner's World website today, I might give it a shot. The writer of the article, Marc Bloom, talks about ways to make pool running one of your alternatives to other "typical" cross training workouts. 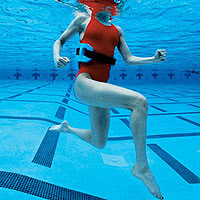 And if you are nursing an injury, pool running might be another way to stay in shape as you heal. He suggests getting a group together to pool run with you, playing a few games or even simulating a favorite running workout in the water (pacing, speed, etc.) to make it more fun.